I don’t know about you, but I frequently find that mealtimes can get a bit repetitive, especially when we’ve had to cut yet another staple from M’s diet. 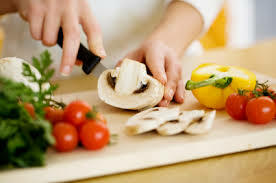 Much as I love to cook and bake, sometimes I really, really hate having to decide what to prepare for dinner. Add into the mix the need for packed lunches on a daily basis, which are generally formed of the same key ingredients due to a restricted diet and I end up pulling my hair out in desperation. M’s recent longing for a prawn mayonnaise sandwich meant that I had to seek inspiration and work out whether it was possible to create something even vaguely similar or not. The easy bit, believe it or not, was the prawn mayonnaise. 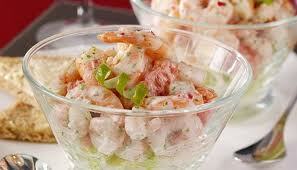 Using a squirt of some Really Not Dairy original mayonnaise, a dash of Heinz tomato ketchup and a generous serving of prawns, I was able to whip up a reasonable prawn cocktail. I diced a chunk of cucumber, grated some carrot and threw a handful of sweetcorn in to add a couple of portions of vegetables to the filling too. This mayonnaise is egg-, dairy- and soya-free and tastes more like salad cream than traditional mayonnaise, but it does the job and has been a great find for M.
Next came the more challenging aspect, the bread. G is able to enjoy Genius bread, which is the best gluten- and wheat-free bread we’ve tried, but unfortunately it contains both egg white and potato starch which are now excluded from M’s diet. M’s sandwiches are usually made from Sakata rice crackers as his bread is really only edible when toasted, but these are small and don’t lend themselves to being a critical part of a prawn mayonnaise sandwich! 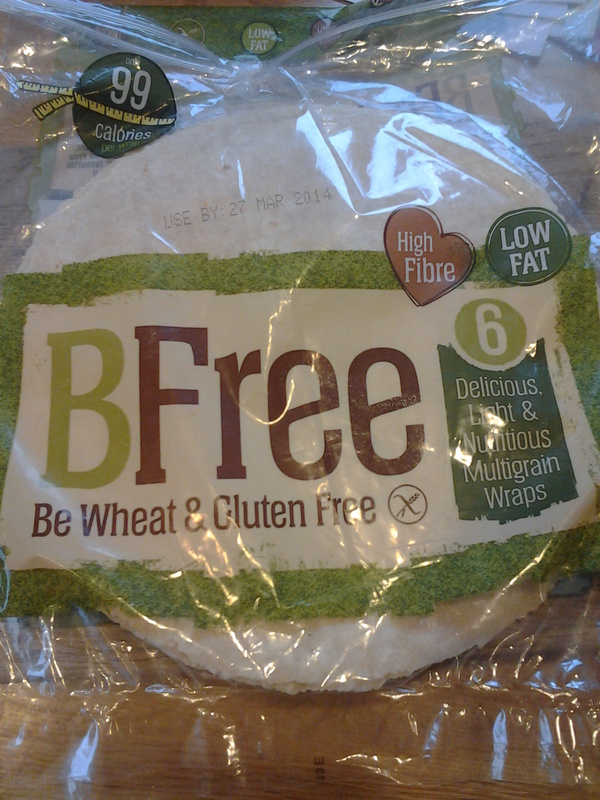 Mike and I both enjoy eating wraps, either for lunch or filled and baked for a Mexican inspired dinner and at last year’s Allergy and Free From show we stumbled across the amazing Bfree gluten-free wraps. These taste delicious and both children enjoyed them whilst we had some. Unfortunately, they are incredibly difficult to source in the UK, though most larger Asda stores do stock them now and I headed to our nearest shop with my fingers tightly crossed to see if they were available. Part of my regular shopping routine, even when buying foods that I’ve bought before, is to scan quickly through the ingredients list for anything that isn’t M-friendly. Recipes do change, even on tried and tested products, so it’s worth those few extra minutes to avoid days or even weeks of pain because of a missed offending food. To my dismay, I noted that the wraps contained potato starch, which is now a forbidden food for M and I thought my chances of buying a good alternative to satisfy M’s cravings were over. I went home and even attempted to make some M-friendly wraps, but the rice flour didn’t lend itself to the recipe and the kids understandably turned their noses up at the finished product that was presented to them. 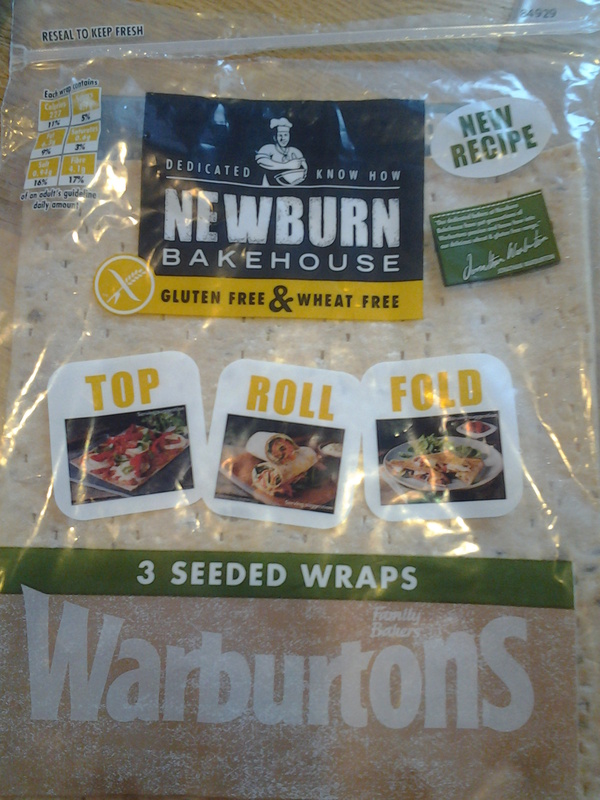 It was a couple of weeks later when I was in our local Waitrose, that I spied a new-to-me package on their free-from shelves, Newburn Bakehouse gluten-free wraps. I picked it up to cast my eye over the ingredients, fully expecting to find either egg or potato flour or both lurking there, but to my delight, this new product contained nothing that wasn’t M-friendly and I quickly snapped up the remaining pack to take home and try. 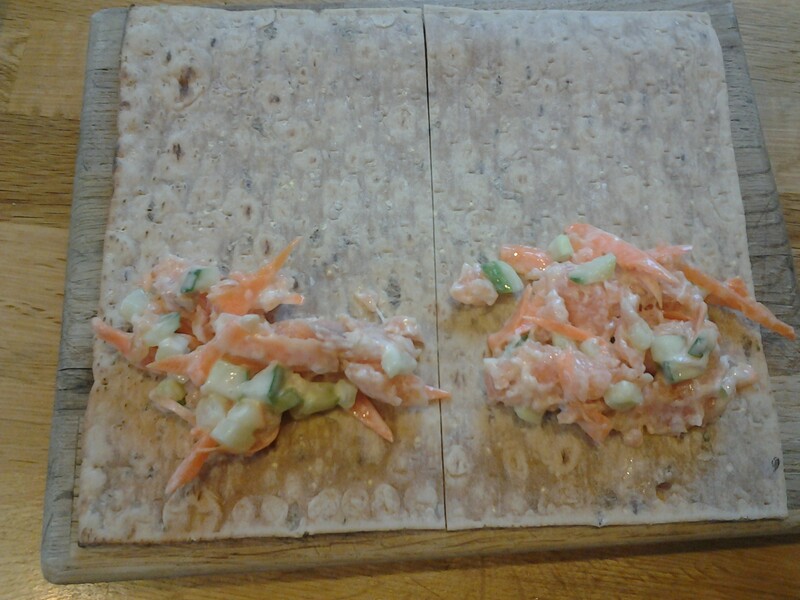 I prepared M’s lunch using one of the Newburn Bakehouse wraps and a generous spoonful of my home-made prawn mayonnaise and called him to the table. He was overwhelmed to see his much longed-for sandwich waiting for him and made short work of devouring it all. He relished every bite and, what’s more, requested a second wrap, something that doesn’t happen all that often in our household. The wraps looked and tasted good and, with 3 to a pack, there was enough left for his school lunchbox on Monday. Both M and I award them with a much-deserved 10 out of 10 – a great product, delicious to eat and suitable for a MEWS-diet, what more could a Mum ask for? This entry was posted in General and tagged allergic reaction, Allergy, Allergy Show, Asda, Awareness, Baking, bread, Dairy free, Egg free, Food, food allergies, Free from Show, Genius bread, gluten-free, Gluten-free diet, home cooking, ill health, Newburn Bakehouse, packed lunches, parenting, Soya free, Special Diets, Waitrose, wheat free, wraps on March 25, 2014 by bluesingingdragon.